If you have a relative with dementia , The Crystal Project can support you. If you have a relative with dementia you can meet with a HSE Occupational Therapist for information, advice and support. Please view the Memory Resource Room page for more information or click on the Memory Resource Room leaflet (below). If you are interested in learning more about dementia, you can attend a six week information and support programme. Topics covered include an overview of dementia, communication, safety at home, nutrition, personal care, occupation and legal issues. These sessions also provide you with the opportunity to meet other families in a supportive environment. These sessions run from 7-9.30pm, one evening a week for six weeks. They are held twice a year in Mallow Primary Healthcare Centre. For information on when the next programme is being held, contact the project. If you would like to meet others in similar situations and learn more about dementia, you can come to our support meetings. They are held four times a year and a different topic is explored at each meeting. We meet in St Marys Day Care Centre (Alzheimer Society of Ireland), Lenihans Lane, Lower Bearforest, Mallow from 7.30-9pm. For information on the next Café de Mentia, go to the newsfeed section of this website. You can also attend ‘Singing for the Brain’, a weekly group for anyone who enjoys singing. This group has been running since January 2015 and is facilitated by Eoin O’Brien, the talented musician. Each week we do warm up activities, sing well known pieces followed by a sing along where anyone can lead us in their favorite song. Tea and coffee are provided at this really sociable group. No talent or experience are necessary attend and this is an opportunity for you and your relative to do something fun together. Singing for the Brain is held every Tuesday afternoon in Mallow Primary Healthcare Centre. Six week introduction to mindfulness groups are facilitated by the project. Topics covered include explaining mindfulness, the benefits of slowing down, acceptance, self compassion and anxiety. Opportunities to discuss the challenges you may be experiencing are also facilitated. 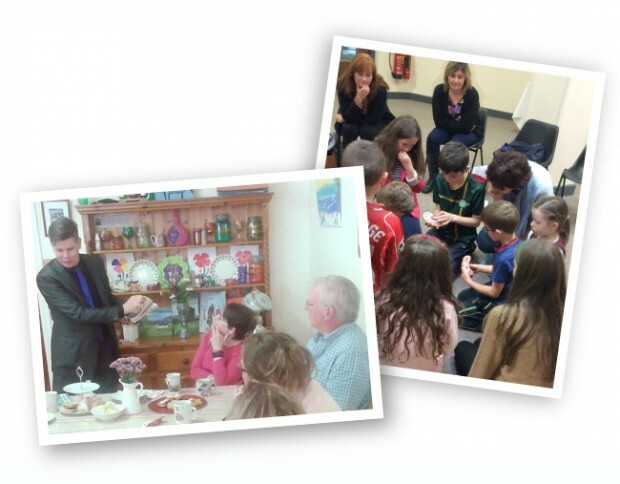 These sessions are held in Mallow Primary Healthcare Centre, both during the day and in the evenings. For information on when the next group is being held, contact the project. If there are children in your family interested in learning about dementia, they can come to a children’s afternoon. Through the use of arts, crafts and fun interactions they can learn what they can do to help their relative with dementia. These sessions are for primary school children and are facilitated when there is sufficient interest. If children in your family would like to attend, contact the project to express their interest. If you wish to remain up to date on project activities, new resources, national initiatives or research opportunities, you can be added to our mailing list. Simply get in touch to register your interest and provide your contact details.